THIS BOOK WILL SHOW YOU HOW TO ANALYZE THE NEED FOR A NEW EMERGENCY DEPARTMENT AND DEVELOP ECONOMICALLY SOUND SOLUTIONS FOR ANY EMERGENCY DEPARTMENT CONSTRUCTION PROJECT — IN SHORT, HOW TO DELIVER MORE CAPACITY WITH FEWER AVAILABLE CAPITAL RESOURCES. 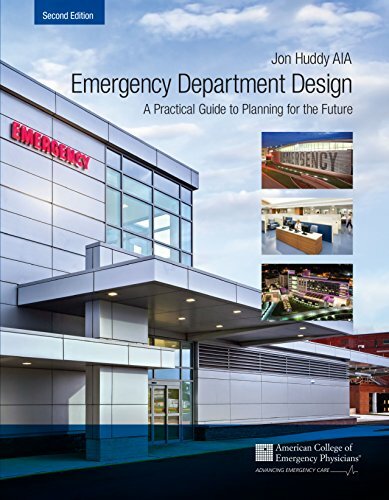 Emergency Department Design: Maximizing Emergency Department Facility Productivity and Patient Work-Through with Interior Design, Hospital Planning and 27 Actual Case Studies, second edition, is a one-of-a-kind resource written by the nation’s foremost authority on emergency department design with over 300 departments and facilities nationwide and published by the world’s largest emergency medicine organization. It explains the architectural interior design process specific to hospital emergency departments and teaches emergency doctors, emergency nurses, hospital administrators, and other health care providers how to prepare and lead a hospital design team. The book presents the design process in sequence, from needs assessment through scope definition and design to the finished product, pointing out potential pitfalls and special considerations along the way. Chapters include checklists and worksheets and hundreds of hospital architecture drawings and floor plans to support the specific hospital planning process. Special design considerations are covered in detail, including pediatric and geriatric emergency departments, freestanding emergency centers, safety and security measures, lean design, and much more. The foundation of all the recommendations is patient care and how it can best be delivered according to the needs of the community — and not according to a “cookie cutter” or standardized design. The second part of the book comprises 27 case studies – all designed to solve specific problems and meet specific needs, such as behavioral health, historic preservation, lean processing, “no wait,” overcrowding, physician-directed patient flow, privacy, surge capacity, threat mitigation, wayfinding, and more. Expanded case studies section – 27 new projects from your peers and design professionals across the country – all designed to solve specific problems and meet specific needs, such as behavioral health, historic preservation, lean processing, “no wait,” overcrowding, physician-directed patient flow, privacy, surge capacity, threat mitigation, wayfinding, and more.